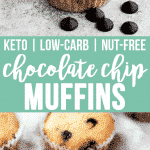 These Low-Carb Chocolate Chip Muffins will satisfy your craving for something sweet, keep you in ketosis, and won’t spike your blood sugar! Over the course of developing recipes for Real Balanced, I have received many requests for nut-free recipes and I have begun to experiment with the challenge! If you’ve baked low-carb or paleo treats, you know that almond flour is a staple ingredient; however, it is certainly not a requirement when coconut flour is an option, so long as the ratios of other ingredients counter-balance the coconut flour‘s ability to soak up liquids. These muffins are entirely nut-free, so they are a wonderful choice for dessert for those who personally have a nut allergy or cook for someone who does. 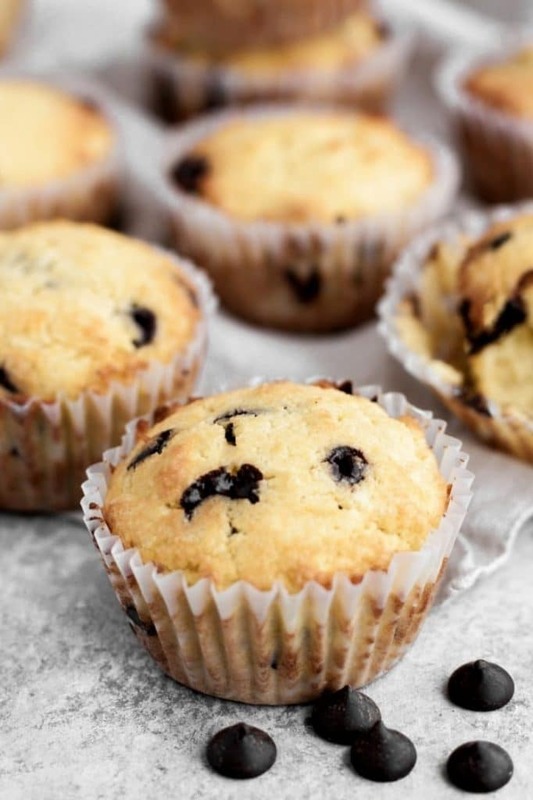 In addition to these being nut-free, these muffins are also low in carbohydrates! I love to develop new dessert recipes that are compliant with a ketogenic diet and these muffins fit the bill perfectly! They are low-carb, yet taste like traditional soft muffins, just without any of the inflammatory, high-carb ingredients. For this recipe, like a majority of my other dessert recipes, I used Lakanto Monk Fruit Sweetener, a net-carb-free, natural sweetener that looks and tastes just like traditional sugar. If you’ve ever experienced a “weird aftertaste” from other low-carb sweeteners, I highly recommend trying Lakanto’s monk fruit sweetener! You can use code “REALBALANCED” for 20% off your total order! 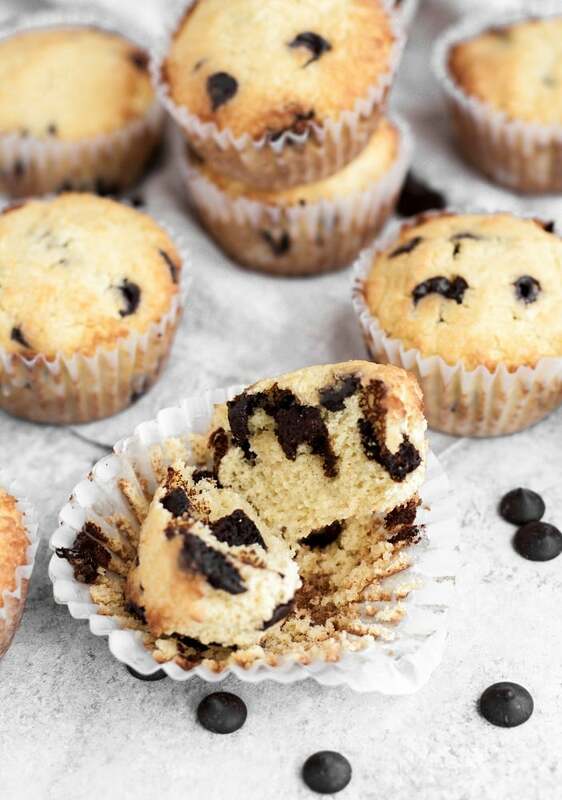 Another ingredient to note in these muffins is the chocolate chips. In this recipe, like in my recipe for No-Bake Chocolate Chip Almond Butter Fat Bomb Bars, I used high-quality chocolate chips that contain only one ingredient: chocolate. Most low-carb chocolate chips contain other ingredients, such as soy, which many try to exclude from their personal diet. Pascha is a great brand that I purchase either at my local co-op grocery store or on Amazon. These muffins are a great dessert option for those who follow a ketogenic diet, eat a gluten-free diet, or have a nut allergy! Keto and Low-Carb: One muffin contains only 2.2 grams of net carbs per serving. Nut-Free: Coconut flour is used in this recipe in place of other nut flours, such as almond flour. 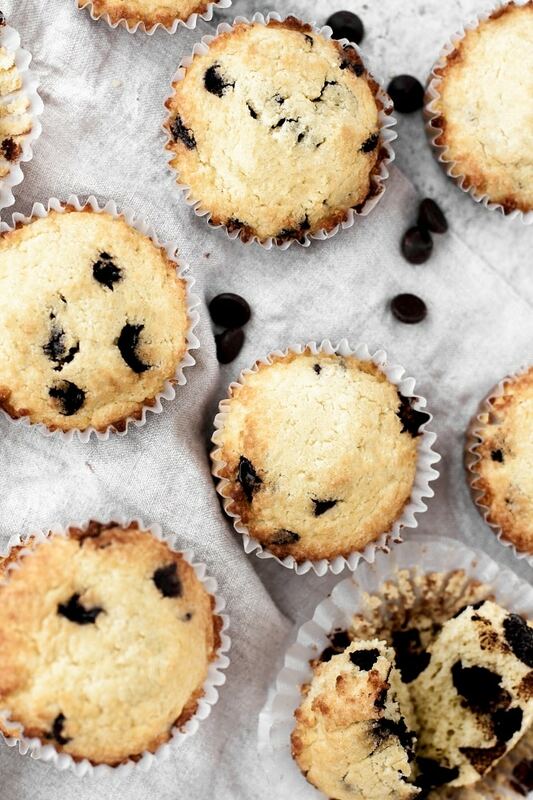 Gluten-Free and Grain-Free: These muffins are made with ingredients that are free from both gluten and grains. Soy-Free: Many low-carb chocolate chips are made with soy. 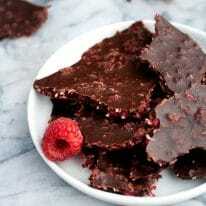 The chocolate chips used in this recipe are free from soy. 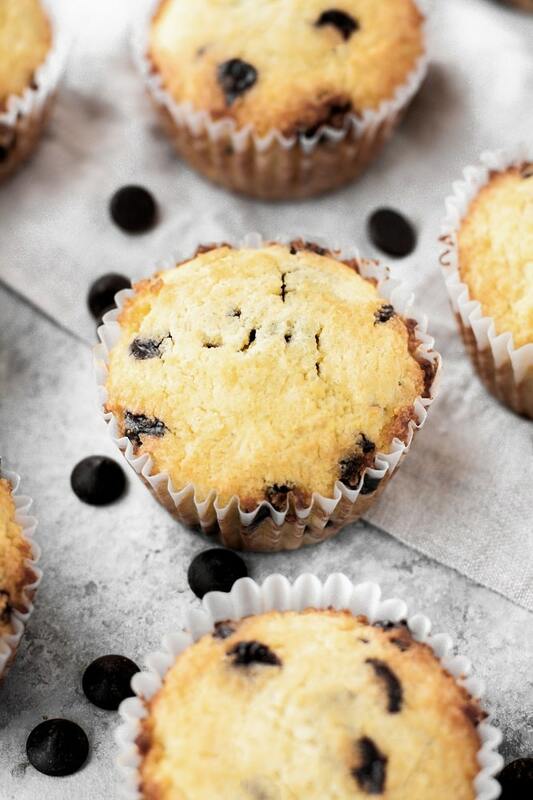 One muffin contains 2.2 grams net carbs per serving. 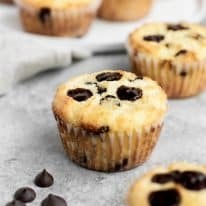 These Low-Carb Chocolate Chip Muffins are low-carb, keto, nut-free, soy-free, gluten-free, grain-free, vegetarian, and refined-sugar-free. 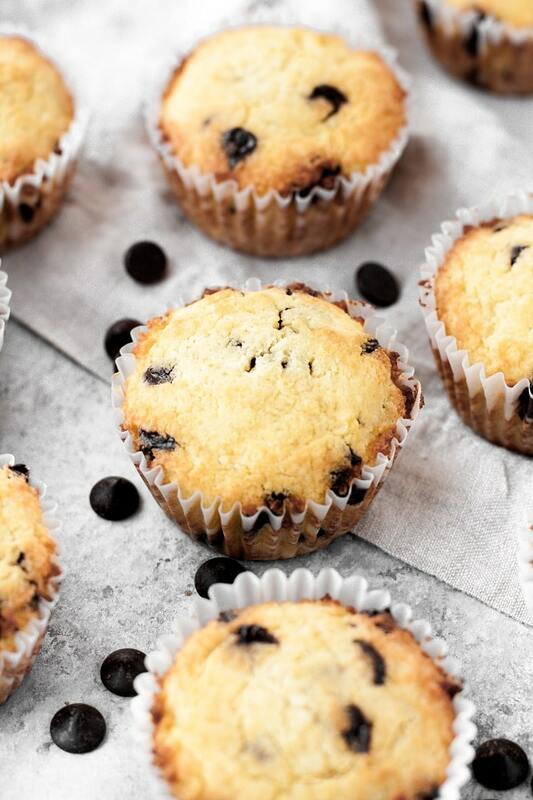 These Low-Carb Chocolate Chip Muffins are the ultimate keto treat to satisfy your sweet tooth! 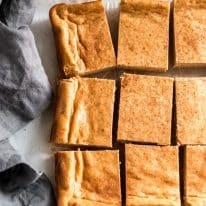 This recipe is low-carb, keto, nut-free, soy-free, gluten-free, grain-free, vegetarian, refined-sugar-free, and contains only 2.2g net carbs per serving! To a mixing bowl, add eggs, monk fruit sweetener, heavy whipping cream, cream cheese, vanilla extract, cream of tartar, baking soda, and salt. Mix with an electric mixer until ingredients are combined. In a microwave-safe bowl, melt butter. To mixing bowl, add melted butter and coconut flour. Mix with electric mixer until fully incorporated. Fold chocolate chips in to dough. Spoon dough into individual muffin liners. They were so sweet and moist! They really hit the spot and satisfied my sweet tooth while on the keto diet. I’m not a huge baker but the recipe was easy to follow and quick. Thank you so much! I will be making them again and looking on your site for other recipes as well. Yay! So happy to hear that you enjoyed the recipe, Devon! Thank you for taking the time to leave a comment and recipe rating!!! Hi, Robin! It would depend on what sweetener you decide to use. Stevia would likely require much less to sweeten the muffins (most brands have a conversion chart on the packaging or on their website). Sweeteners like Swerve or erythritol would sub in at a 1:1 ratio. Enjoy!! So glad you enjoyed, Katie! Cream cheese on top sounds AMAZING! 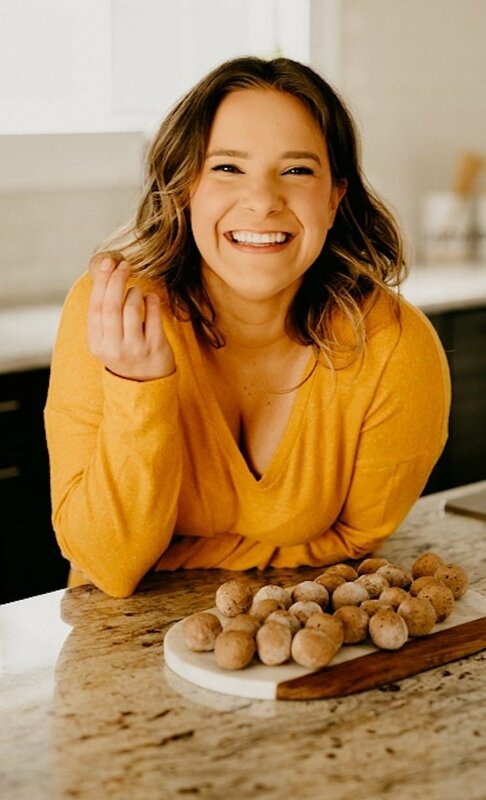 Wow Sara, what a great Keto recipe. Just started on a Keto diet and looking for treat recipes like yours. Will be making these muffins pretty soon. Will be using Xylitol or Sukrin as a sweetener as I don’t have Monk fruit. Love your recipes been following your site for ages and have made several of your recipes which never failed. Wanda, your comment just made my day! Thank you so much for taking the time to write such a sweet message; I appreciate it so much! These muffins are DELICIOUS. I hope you enjoy!